I found this website MediGuard.org | Safer Medicines, Healthier You that offers to check for free if there's any risky interactions between drugs you're taking. I don't know who actually has only six medications (and it says include non-prescription medications in the list.) I'm sure at some stage of my life I had six or less - but that seems a very long time ago, and maybe I only dreamed it. I'm currently on 12 medications. (Sad, but true. 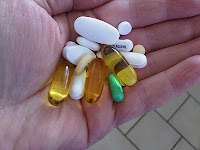 Sometimes I wonder if I could get away with having my pills instead of meals rather than with them.) Some of them are to counteract the side effects of others. Some are for things like asthma and allergies, not just lupus. I just have to count on my GP to know what she's prescribed, what the specialist has prescribed, and to keep checking that they are all OK together - something I know she's careful to do. It is possible for drugs to react badly with each other. It's a serious matter, and it's important that every time your medicine's changed you check that everything will still work OK together. If you're not sure about yours, you could ask the internet, but it might be better to check with your doctor!